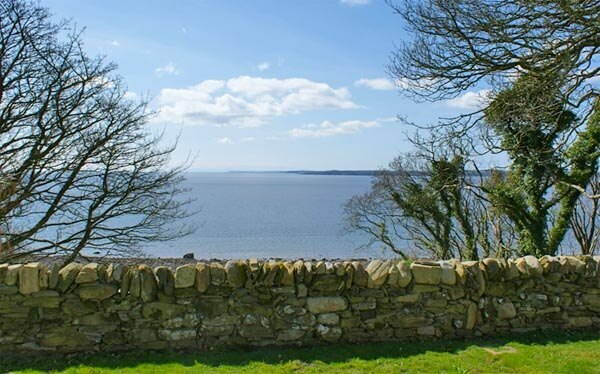 Stunningly situated with uninterrupted sea views and within walking distance of the shore, Kirkdale Bank is situated on the Kirkdale Estate, home to the Hannay family for the last 500 years. 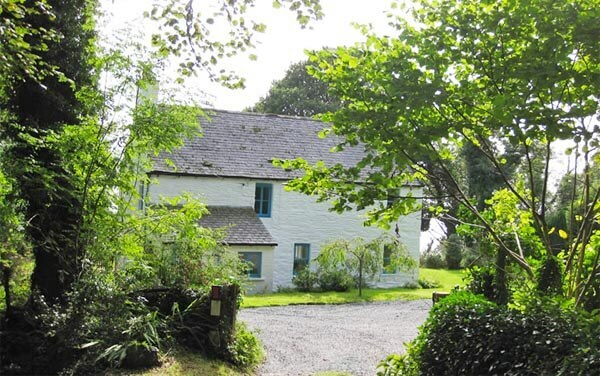 The property is surrounded by woodland and looks out over the magnificent Solway Firth and beyond to the Isle of Man. The house benefits from a fully enclosed south facing garden looking out to sea and a further large garden to the side and rear. The house has been completely refurbished and offers a fantastic opportunity for a coastal holiday with stunning sea views. Situated on the Solway coastline, 5 minutes to the west of the attractive town of Gatehouse of Fleet, there is plenty to see and do locally. The area boasts stunning sandy beaches, the famous Seven Stanes mountain biking centre, forest walks, a huge choice of golf courses, fishing, tennis, clay pigeon shooting, archery and horse-riding. Guests are welcome to use the golden sandy beaches at the private Cardoness Estate only 3 miles away. Cream o' Galloway, the award-winning organic ice-cream and dairy farm with children's indoor and outdoor play area is within 10 minutes drive - an ideal day's visit for a family. The house is 15 minutes from Kirkcudbright, a beautiful coastal town famous for its artists and 20 minutes from both Castle Douglas, South-west Scotland's food town, and Wigtown, Scotland's book town. There are plenty restaurants and cafes to choose from locally. 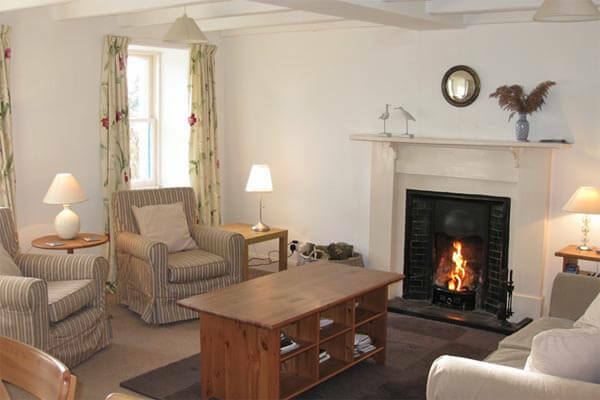 Or curl up in front of a real log fire and enjoy looking out to sea. Kirkdale Bank has been completely renovated to provide very comfortable high quality self-catering accommodation. The house has a private driveway and fully enclosed south facing garden. There are gates to allow vehicle access to enclosed garden at front if required. A further garden opens to the side and rear. In addition to parking at the door there is parking at the rear (by the back door) and on the drive for at least 2-3 vehicles. There is a secure bicycle store with outside water supply for cleaning. The south facing sitting-room has 2 windows looking out to sea and 2 windows overlooking the attractive garden at back. There is a working open fire and a dining table which can seat 8-10. 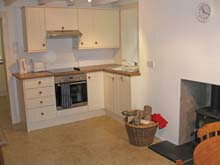 The eating kitchen looks out to sea, with table by the window and wood burning stove - free logs are provided. It is fully equipped with a dishwasher and fridge/freezer. There is a larder and utility room, with washer/drier, off and a downstairs WC. The back door provides access via utility area/boot area. 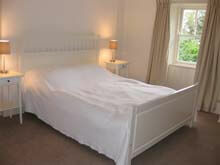 Upstairs there is a king sized bedroom with sea views and also a twin bedroom with sea views. 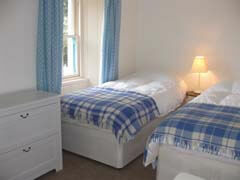 The bunk bed room - full size beds, has a window which overlooks the rear garden. Upstairs there is a family bathroom with shower. The property benefits from gas central heating. From the east, travel west on A75 from Dumfries for approx 32 miles. 5.5 miles west of Gatehouse of Fleet you will see a brown sign to the right for Cairnholy Chambered Cairns. Do not follow this sign but about 100 yards after this sign take the first turning on your left, follow private track down hill for about 100 yards and on first corner you will see Kirkdale Bank. From the west, travel east on the A75 from Stranraer towards Creetown and Carsluith. 1.5 miles after Carsluith Castle you will see two brown signs for Cairnholy Chambered Cairns, do not follow these signs but between the two brown signs there is a turning off to the right - then as above. 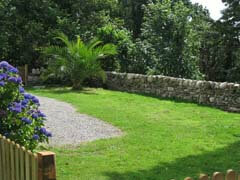 Everything is included in the rental price - heating, electricity and logs for the stove and fire. Bed linen and towels are provided. (Winter fuel supplement applies Oct - March). A maximum of two well behaved dogs are welcome. Kirkdale Bank is rented all year round. Short breaks are available. For larger parties or two parties seeking accommodation close by a second cottage on the estate (Kirkdale Port) is relatively nearby, also sleeping 6. The two properties are not visible to each other - a private track of 0.5 mile separates them. For further information please see the entry at Kirkdale Port. 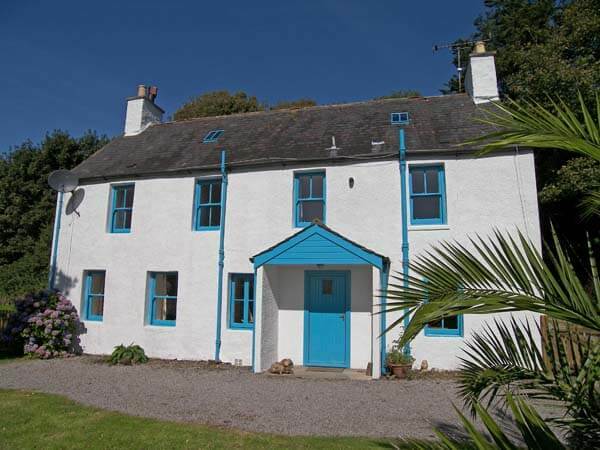 To book this beautiful Galloway holiday house by the sea, click the enquiry button below and see availability and prices. This delightful Galloway holiday house has uninterrupted views of the sea and is a short walk from the shore. It's ideal for a seaside holiday and also to explore the unspoilt countryside of Galloway. There are wonderful castles, golf courses, sandy beaches and excellent cycle paths in the area - something for all the family!